Raspberry Sorbet Wine Spritzer | Dizzy Busy and Hungry! 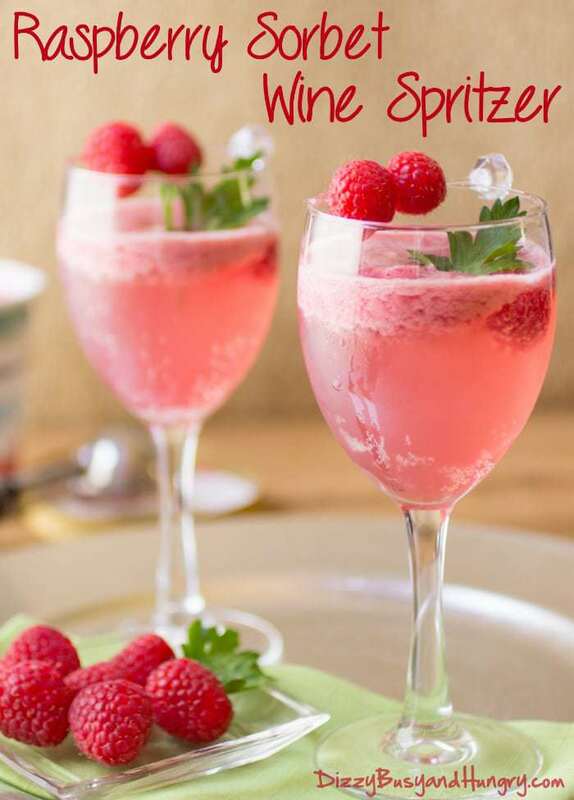 This raspberry sorbet wine spritzer is pretty, refreshing, and delicious – perfect to serve for a summer evening gathering, a book club meeting, or a fun girls’ night out! Every mom (and dad!) could use a cocktail break now and then, am I right? Sweet, light, cool, and fruity, this adult beverage is the perfect refresher for a warm summer evening. It is part dessert and part cocktail, and completely delicious! 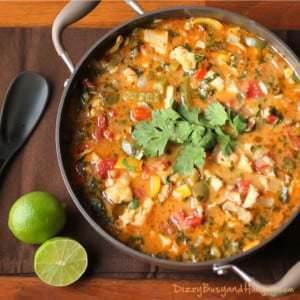 And really easy too, with only three ingredients! 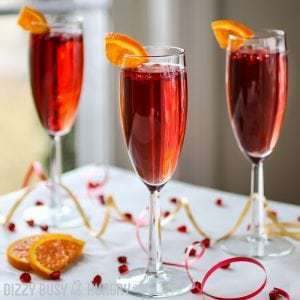 You can use your favorite white wine in this spritzer and it will be delicious, but my favorite wine in this recipe is a slightly sweet wine like a Moscato. Having a girls’ night out? This would be the perfect drink to serve, alongside a nice fruit tray and some fancy chocolates! Tip! If the kids are looking at your drink and wishing they could have some, you can always make a virgin version with just the sorbet and the ginger ale. Thing 2 tried it and gave it two enthusiastic thumbs up! 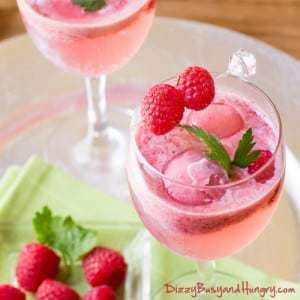 So pretty, refreshing, and delicious! 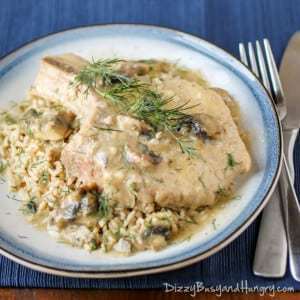 Perfect to serve for a summer evening gathering! 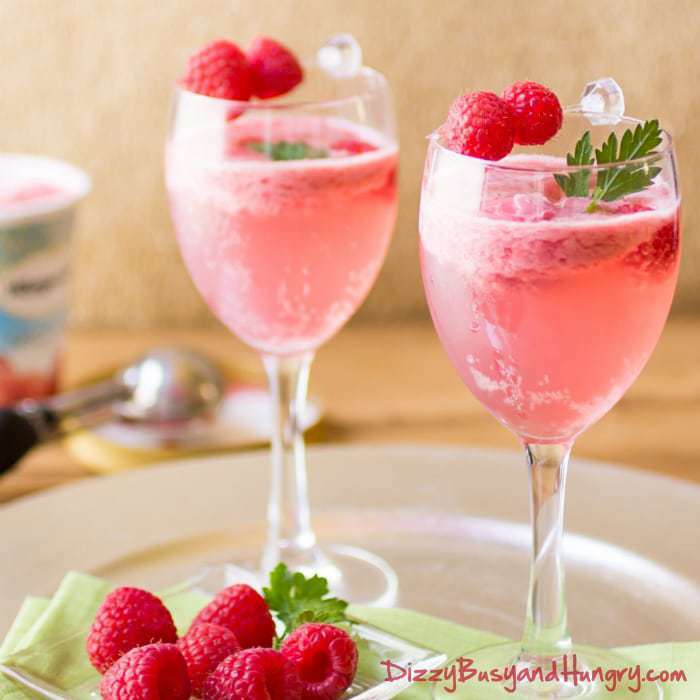 With a small cookie scoop, scoop out two balls of sorbet and place in a wine glass. Pour the white wine over the sorbet until the glass is about 3/4 of the way full. Pour the ginger ale to fill the remaining 1/4 of the glass. This sounds perfect! I’m serving this at our next barbecue for sure ! How refreshing and festive! Thanks for sharing with SYC.